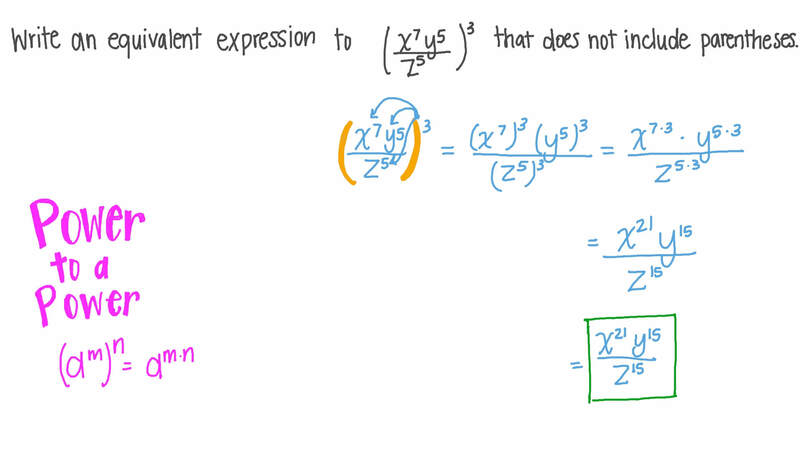 In this lesson, we will learn how to simplify monomials involving two or more variables with power of a quotient using laws of exponents. Write an equivalent expression to  𝑥 𝑦 𝑧  7 5 5 3 that does not include brackets. Simplify ( 𝑎 ÷ 𝑏 ) 7 1 0 . Simplify  𝑥 𝑦  3 4 4 . Simplify  𝑥 𝑦 𝑧  3 2 3 3 . Simplify  𝑎 𝑏 𝑐 𝑑  2 4 5 6 3 . Write an equivalent expression to  𝑥 𝑦 𝑧  4 5 4 that does not include brackets. Write an equivalent expression to  − 𝑥 𝑦 𝑧  5 4 3 that does not include brackets. Write an equivalent expression to  − 𝑥 𝑦 𝑧  6 5 6 5 that does not include brackets. Write an equivalent expression to  𝑥 𝑦 𝑧  2 5 7 5 that does not include brackets.